Students from the Arboretum’s Fiddlehead Forest School. The tally is in—and we’re very excited! 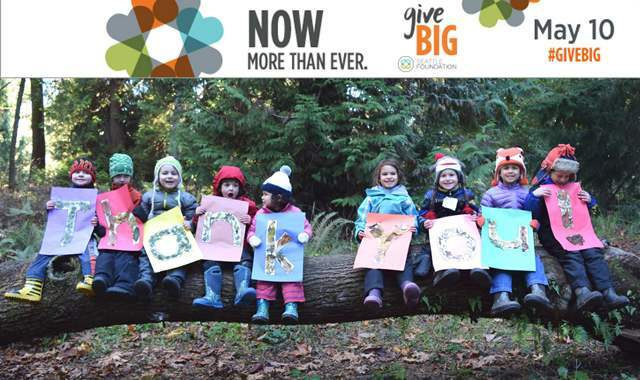 The Arboretum received a total of $32,058 during the Seattle Foundation’s annual GiveBIG event on May 10. This included a $2500 “Dollars for Change” award from the GiveBIG sponsors, handed out raffle-style to some participating non-profits. It also included a $2,500 matching fund from an anonymous donor and a designated gift of $2,000 from Arboretum Foundation Unit 1/75. About 190 individuals donated to Arboretum altogether. Our sincere thanks to everyone who invested in this unique green space! Your generosity supports the maintenance and volunteer programs that keep the Arboretum beautiful and safe. It also supports immersive education programs that connect thousands of Seattle’s children to the natural world each year.